New "Faith" Helps Gertie Gear™ Stay on Top! Pet Air Beds Rise Again in AKC (Must Haves) Gear Guide. Westland, Mich. — Gertie Gear™ continues to hold-air with the American Kennel Club (AKC). 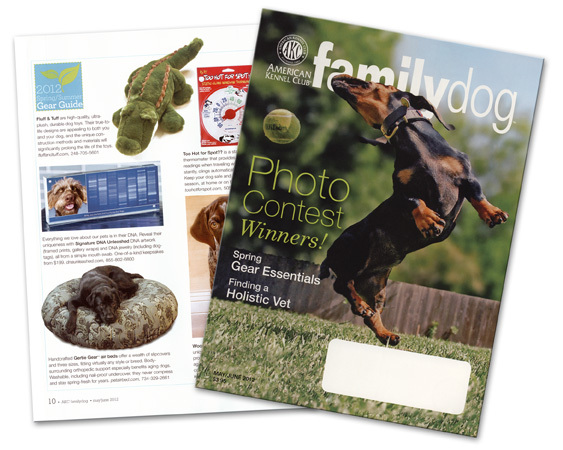 For the third consecutive year, Gertie Gear pet air beds capture a coveted spot in the AKC’s Spring/Summer Gear Guide, a list of canine “must haves” (May/June 2012, AKC Family Dog magazine). This year Gertie Gear introduces a precious, new dog model named “Faith” as well. “We’re thrilled to be included again, and to have such a special dog as our newest model!”, says Julie King, who designed the air bed system for her aging beagle, “Gertie” in 2007. Faith is more than just a beautiful, well-mannered black Lab. Faith is a working dog, handpicked at birth by Paws With a Cause to be raised as a service dog. After a year with a foster family and six concentrated months of training, Faith was placed with her current family and companion, Amy. Faith sleeps on a Gertie Gear air bed, because, “She needs a good nights sleep, so she will be super alert and ready for action when I need her!”, says Amy. “She means the world to me. Aside from helping me gain some independence, she is a sweet and loving pal!” Faith continues to train; her favorite “trick” is finding the phone anywhere in the house and bringing it on command. Faith’s spirit and loving nature honors Gertie’s memory, who past at the estimated age of 16 in 2010. Gertie, was adopted from a local shelter and immediately exhibited health problems, including mild seizures, back pain, and incontinence. Before the Gertie Gear air bed, she would pee on beds 1-3 times a day. After trying different styles of traditional stuffing/foam dog beds, none measured up to Gertie’s needs for support and comfort, nor King’s expectations for a bed that would also be low maintenance and long lasting. The three-part air bed system consists of a round inflatable that provides the odor free, orthopedic “filling”; a zippered, claw & nail proof canvas inner cover that protects the tube and provides a natural, body surrounding nesting area/head pillow; finally, an elastic bound slipcover creates a custom look to fit any style, decor or season. Available in three sizes with a multitude of slip cover choices, Gertie Gear pet air beds are completely washable and an affordable orthopedic solution for dogs and cats of all ages but especially beneficial to aging pets with special needs. All covers are hand-crafted in Michigan using commercial grade materials and durable apparel, slipcover fabrics.